On Friday July 25th the BBC’s Jon Donnison reported from Jerusalem for BBC television news on the topic of the ‘Day of Rage’ called for by assorted Palestinian factions including Hamas on that date. 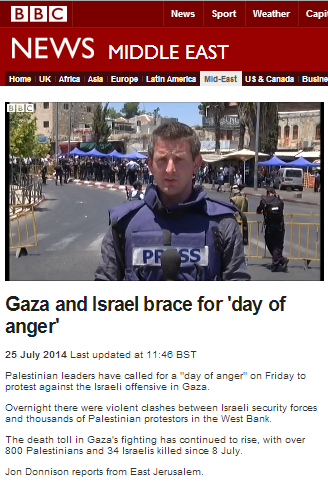 The report also appeared on the BBC News website under the title “Gaza and Israel brace for ‘day of anger’“. In that report Donnison described the events of the night before at Qalandiya checkpoint. Like all the other BBC journalists who reported on those violent riots in Qalandiya, Donnison failed to inform BBC audiences that the two Palestinians killed were shooting live ammunition at the police officers present at the time and that the shootings were claimed by Fatah’s Al Aqsa Martyrs Brigade. 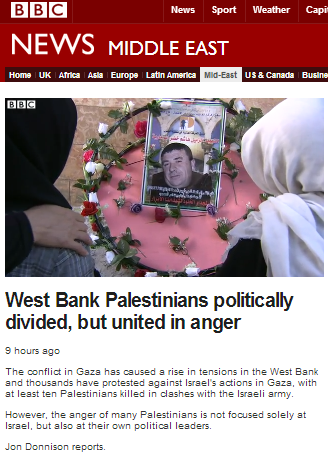 On July 29th Donnison produced another filmed report for BBC television news (which also appeared on the BBC News website under the title “West Bank Palestinians politically divided, but united in anger“. In that report too Donnison referred to the rioting in Qalandiya – which he insists of course on describing as “protests” and “clashes” – without informing BBC audiences of the live fire claimed – significantly – by a terrorist group affiliated with the PA’s dominant party. Donnison does not inform viewers of the location of the rioting during which Hashem Abu Maria was shot, but it happened in his home town of Beit Ummar – a place which might be familiar to some readers because of the not infrequent attacks on Israeli drivers there and the fact that the town’s residents seem to have a repeated habit of flying Nazi flags. Donnison is equally vague about that “children’s charity” for which the pleasant-sounding Mr Abu Maria worked. In fact he was an employee of a political NGO with which many readers will also be familiar – Defence for Children International – Palestine Section. That NGO – frequently quoted and promoted by Western journalists – has links to other anti-Israel organisations including the Alternative Information Centre and the ISM – which has a permanent representative also connected to the extended Abu Maria family in Beit Ummar. But most notably, that “children’s charity” also has links to a terror organization – the PFLP – via one of its board members and also, it transpires, via none other than its former employee Hashem Abu Maria. 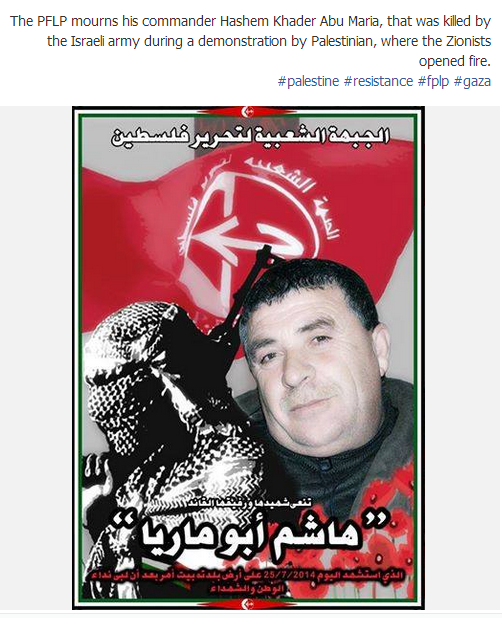 Below is a screenshot of the PFLP’s Facebook announcement and here is an obituary on the PFLP website which describes Jon Donnison’s ‘charity worker’ as “fighter commander”. Below is footage filmed in Beit Ummar on July 25th – apparently after Hashem Abu Maria was killed – showing one of those “protests” as Donnison euphemistically describes them. The tower is an Israeli army position – note the PFLP flag. Clearly BBC editorial standards of accuracy would demand that Jon Donnison tell audiences about the real nature of the so-called “children’s charity” for which Hashem Abu Maria worked and his membership of the PFLP. But just as obvious is the fact that Donnison’s lack of accuracy serves a higher goal: the sympathy-inducing presentation of Abu Maria as a family man and a ‘charity worker’ who “gave his life trying to protect children” would be somewhat less convincing to audiences if they knew he was a member of a terrorist organization. Clearly too, Abu Maria as he is portrayed is intended to serve as signposting for audiences in Donnison’s overall representation of ‘protesting’ Palestinians killed by Israeli forces. Like his failure to inform viewers of the live fire at the Qalandiya riots, the aim of that selective portrayal is to direct audiences towards a specific understanding of events which does not include the entire picture. And that can only be interpreted as a deliberate breach of BBC guidelines on impartiality.